To understand the photovoltaic effect, some basic theory about semiconductors and their use as photovoltaic energy conversion devices needs to be given as well as information on p-n junctions. These are explained in the following sections. As is well known, atoms consists of the nucleus and electrons that orbit the nucleus. According to quantum mechanics, electrons of an isolated atom can have only specific discrete or quantized energy levels. In elements that have electrons in multiple orbitals, the innermost electrons have the minimum (maximum negative) energy and therefore require a large amount of energy to overcome the attraction of the nucleus and become free. When atoms are brought close together, the electronic energy of individual atoms is altered and the energy levels are grouped in energy bands. In some energy bands, electrons are allowed to exist, and in other bands electrons are forbidden. The electrons at the outermost shell are the only ones that interact with other atoms. This is the highest normally filled band, which corresponds to the ground state of the valence electrons in an atom and is called the valence band. The electrons in the valence band are loosely attached to the nucleus of the atom and, therefore, may attach more easily to a neighboring atom, giving that atom a negative charge and leaving the original atom as a positive charged ion. Some electrons in the valence band may possess a lot of energy, which enables them to jump into a higher band. These electrons are responsible for the conduction of electricity and heat, and this band is called the conduction band. The difference in the energy of an electron in the valence band and the innermost shell of the conduction band is called the band gap. A schematic representation of the energy band diagrams of three types of materials is shown in Figure 9.1. Materials whose valence gap is full and whose conduction band is empty have very high band gaps and are called insulators because no current can be carried by electrons in the filled band and the energy gap is so large that, under ordinary circumstances, a valence electron cannot accept energy, since the empty states in the conduction band are inaccessible to it. The band gap in these materials is greater than 3 eV. FIGURE 9.1 Schematic diagrams of energy bands for typical materials. (a) Insulator. (b) Conductor (metal.) (c) Semiconductor. Materials that have relatively empty valence bands and may have some electrons in the conduction band are called conductors. In this case, the valence and the conduction bands overlap. The valence electrons are able to accept energy from an external field and move to an unoccupied allowed state at slightly higher energy levels within the same band. Metals fall in this category, and the valence electrons in a metal can be easily emitted outside the atomic structure and become free to conduct electricity. Materials with valence gaps partly filled have intermediate band gaps and are called semiconductors. The band gap in these materials is smaller than 3 eV. They have the same band structure as the insulators but their energy gap is much narrower. 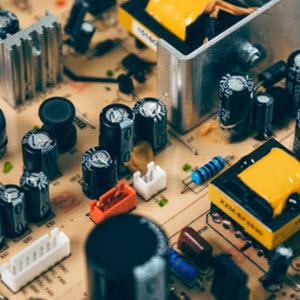 The two types of semiconductors are the pure ones, called intrinsic semiconductors, and those doped with small amounts of impurities, called extrinsic semiconductors. In intrinsic semiconductors, the valence electrons can easily be excited by thermal or optical means and jump the narrow energy gap into the conduction band, where the electrons have no atomic bonding and therefore are able to move freely through the crystal. Silicon (Si) belongs to group 4 of the periodic table of elements. In semiconductors, if the material that is doped has more electrons in the valence gap than the semiconductor, the doped material is called an n-type semiconductor. The n-type semiconductor is electronically neutral but has excess electrons, which are available for conduction. This is obtained when Si atoms are replaced with periodic table group 5 elements, such as arsenic (As) or antimony (Sb), and in so doing, form electrons that can move around the crystal. If these excess electrons are removed, the atoms will be left with positive charges. In semiconductors, if the material that is doped has fewer electrons in the valence gap than the semiconductor, the doped material is called a p-type semiconductor. The p-type semiconductor is electronically neutral but it has positive holes (missing electrons) in its structure, which can accommodate excess electrons. This type of material is obtained when Si atoms are replaced with periodic table group 3 elements, such as gallium (Ga) or indium (In), and in so doing, form positive particles, called holes, that can move around the crystal through diffusion or drift. If additional electrons could fill the holes, the impurity atoms would fit more uniformly in the structure formed by the main semiconductor atoms, but the atoms would be negatively charged. Both types of semiconductors are shown schematically in Figure 9.2. Both n- and p-type semiconductors allow the electrons and holes to move more easily in the semiconductors. For silicon, the energy needed to get an electron across a p-n j unction is 1.11 eV. This is different for each semiconductor material. FIGURE 9.2 Schematic diagrams of n- and p-type semiconductors. (a) n-type, with excess electrons. (b) p-type, with excess positive holes. FiGURE 9.3 Schematic diagram of a p-n junction. FIGURE 9.4 Energy band diagrams of n- and p-type semiconductors. (a) n-type semiconductor. (b) p-type semiconductor. diffuse to the n-type side, leaving the n side of the junction positively charged and the p side negatively charged. The negative charges of the p side restrict the movements of additional electrons from the n side; however, the movement of additional electrons from the p side is easier because of the positive charges at the junction on the n side. Therefore the p-n junction behaves like a diode. A schematic diagram of the energy bands of the n- and p-type semiconductors is shown in Figure 9.4. In the n-type semiconductor, because the doped impurity donates additional electrons for the conduction of current, it is called the donor and its energy level is called the donor level. The n-type energy band diagram is shown in Figure 9.4a, and as can be seen, the donor level is located within the forbidden band. In the p-type semiconductor, the doped impurity accepts additional electrons; therefore, it is called the acceptor and its energy level is called the acceptor level. Its energy band diagram is shown in Figure 9.4b, and as can be seen, the acceptor level is located in the forbidden band. When a photon enters a photovoltaic material, it can be reflected, absorbed, or transmitted through. When this photon is absorbed by a valence electron of an atom, the energy of the electron is increased by the amount of energy of the photon. If, now, the energy of the photon is greater than the band gab of the semiconductor, the electron, which has excess energy, will jump into the conduction band, where it can move freely. Therefore, when the photon is absorbed, an electron is knocked loose from the atom. 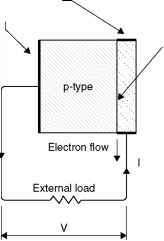 The electron can be removed by an electric field across the front and back of the photovoltaic material, and this is achieved with the help of a p-n junction. In the absence of a field, the electron recombines with the atom; whereas when there is a field, it flows through, thus creating a current. If the photon energy is smaller than that of the band gap, the electron will not have sufficient energy to jump into the conduction band, and the excess energy is converted into kinetic energy of the electrons, which leads to increased temperature. It should be noted that, irrespective of the intensity of the photon energy relative to the band gap energy, only one electron can be freed. This is the reason for the low efficiency of the photovoltaic cells. of a solar cell and are absorbed by the semiconductor, some of them create pairs of electrons and holes. If these pairs are sufficiently near the p-n junction, its electric field causes the charges to separate, electrons moving to the n-type side and holes to the p-type side. If the two sides of the solar cell are now connected through a load, an electric current will flow as long as sunlight strikes the cell. where h = Planck's constant, = 6.625 X 10~34 J-s. v = frequency (s-1). A beam of light with intensity of 3 mW and a wavelength of 743 nm is striking a solar cell. Estimate the number of photons incident on the cell. A photovoltaic cell consists of the active photovoltaic material, metal grids, antireflection coatings, and supporting material. The complete cell is optimized to maximize both the amount of sunlight entering the cell and the power out of the cell. The photovoltaic material can be one of a number of compounds. The metal grids enhance the current collection from the front and back of the solar cell. The antireflection coating is applied to the top of the cell to maximize the light going into the cell. Typically, this coating is a single layer optimized for sunlight. As a result, photovoltaic cells range in color from black to blue. In some types of photovoltaic cells, the top of the cell is covered by a semitransparent conductor that functions as both the current collector and the antireflection coating. 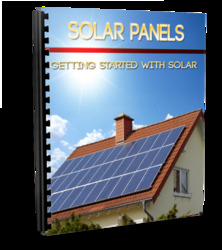 A complete photovoltaic cell is a two-terminal device with positive and negative leads. Silicon is an abundant chemical element covering 25% of the earth's crust. Silicon minerals are cheap, but silicon cells still must be individually fabricated by a long, complicated process that includes purifying the silicon, pulling a long crystal from a high-temperature melt, slicing the crystal into wafers, diffusing impurities into the wafers, and applying various coatings and electrical conducts. Labor now accounts for almost all the cost of a silicon cell. It is expected that fabrication techniques plus automation of the manufacturing process will radically lower the price within the next few years. A photovoltaic PV generator is mainly an assembly of solar cells, connections, protective parts, and supports. As was seen already, solar cells are made of semiconductor materials, usually silicon, and are specially treated to form an electric field with positive on one side (backside) and negative on the other side, facing the sun. When solar energy (photons) hits the solar cell, electrons are knocked loose from the atoms in the semiconductor material, creating electron-hole pairs. If electrical conductors are attached to the positive and negative sides, forming an electrical circuit, the electrons are captured in the form of electric current, called photocurrent, Iph. As can be understood from this description, during darkness the solar cell is not active and works as a diode, i.e., a p-n junction that does not produce any current or voltage. If, however, it is connected to an external, large voltage supply, it generates a current, called the diode or dark current, ID. A solar cell is usually represented by an electrical equivalent one-diode model, shown in Figure 9.6 (Lorenzo, 1994). This circuit can be used for an individual cell, a module consisting of a number of cells, or an array consisting of several modules. where k = Boltzmann's gas constant, = 1.381 X 10" Tr = absolute temperature of the cell (K). e = electronic charge, = 1.602 X 10~19 J/V. 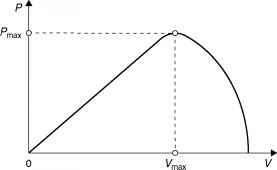 V = voltage imposed across the cell (V). Io = dark saturation current, which depends strongly on temperature (A). 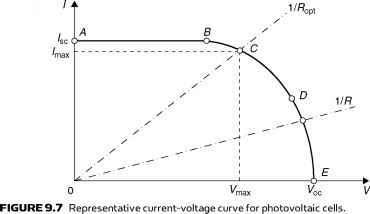 FIGURE 9.8 Representative power-voltage curve for photovoltaic cells. not making a circuit, the voltage is at its maximum (open-circuit voltage, V>c), and the current is 0. In either case, at open circuit or short circuit, the power (current times voltage) is 0. Between open circuit and short circuit, the power output is greater than 0. The typical current voltage curve shown in Figure 9.7 presents the range of combinations of current and voltage. In this representation, a sign convention is used, which takes as positive the current generated by the cell when the sun is shining and a positive voltage is applied on the cell's terminals. The fill factor is a measure of the real I-V characteristic. For good cells, its value is greater than 0.7. The fill factor decreases as the cell temperature increases. Thus, by illuminating and loading a PV cell so that the voltage equals the PV cell's Vmax, the output power is maximized. The cell can be loaded using resistive loads, electronic loads, or batteries. Typical parameters of a single-crystal solar cell are current density Isc = 32 mA/cm2, Voc = 0.58 V, Vmax = 0.47 V, FF = 0.72, and Pmax = 2273 mW (ASHRAE, 2004). This is an explicit equation of the voltage Vmax, which maximizes the power in terms of the short-circuit current (Isc = Iph), the dark saturation current (Io), and the absolute cell temperature, TC. If the values of these three parameters are known, then Vmax can be obtained from Eq. (9.14) by trial and error. Efficiency is another measure of PV cells that is sometimes reported. Efficiency is defined as the maximum electrical power output divided by the incident light power. Efficiency is commonly reported for a PV cell temperature of 25°C and incident light at an irradiance of 1000 W/m2 with a spectrum close to that of sunlight at solar noon. An improvement in cell efficiency is directly connected to cost reduction in photovoltaic systems. A series of R&D efforts have been made on each step of the photovoltaic process. Through this technological progress, the efficiency of a single crystalline silicon solar cell reaches 14-15% and the polycrystalline silicon solar cells shows 12-13% efficiency in the mass production lines. If the dark saturation current of a solar cell is 1.7 X 10~8 A/m2, the cell temperature is 27°C, and the short-circuit current density is 250 A/m2, calculate the open circuit voltage, Voc; voltage at maximum power, Vmax; current density at maximum power, /max; maximum power, Pmax; and maximum efficiency, r|max. What cell area is required to get an output of 20 W when the available solar radiation is 820 W/m2? 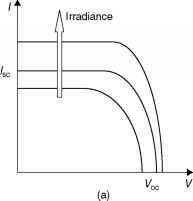 The I-V characteristic of the solar cell, presented in Figure 9.7, is only for a certain irradiance, Gt, and cell temperature, TC. The influences of these two parameters on the cell characteristics are shown in Figure 9.9. As shown in Figure 9.9a, the open circuit voltage increases logarithmically by increasing the solar radiation, whereas the short-circuit current increases linearly. The influence of the cell temperature on the cell characteristics is shown in Figure 9.9b. 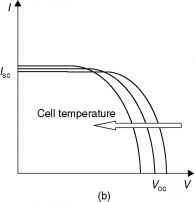 The main effect of the increase in cell temperature is on open circuit voltage, which decreases linearly with the cell temperature; thus the cell efficiency drops. As can be seen, the short-circuit current increases slightly with the increase of the cell temperature. In practice solar cells can be connected in series or parallel. Figure 9.10 shows how the I-V curve is modified in the case where two identical cells are connected in parallel and in series. As can be seen, when two identical cells are connected in parallel, the voltage remains the same but the current is doubled; when the cells are connected in series, the current remains the same but the voltage is doubled. FIGURE 9.9 Influence of irradiation and cell temperature on PV cell characteristics. (a) Effect of increased irradiation. (b) Effect of increased cell temperature. FiGuRE 9.10 Parallel and series connection of two identical solar cells. (a) Parallel connection. (b) Series connection. 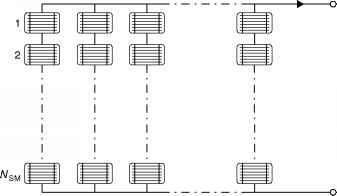 FIGuRE 9.11 Schematic diagram of a PV module consisting of NPM parallel branches, each with NSM cells in series. PV modules are designed for outdoor use in such harsh conditions as marine, tropic, arctic, and desert environments. The choice of the photovoltaically active material can have important effects on system design and performance. Both the composition of the material and its atomic structure are influential. Photovoltaic materials include silicon, gallium arsenide, copper indium diselenide, cadmium telluride, indium phosphide, and many others. The atomic structure of a PV cell can be single crystal, polycrystalline, or amorphous. The most commonly produced PV material is crystalline silicon, either single crystal or polycrystalline. Cells are normally grouped into modules, which are encapsulated with various materials in order to protect the cells and the electrical connectors from the environment (Hansen et al., 2000). As shown in Figure 9.11, PV cell modules consist of Npm parallel branches and each branch has NSM solar cells in series. In the following analysis, superscript M refers to the PV module and superscript C refers to the solar cell. Therefore, as shown in Figure 9.11, the applied voltage at the module's terminals is denoted by V^, whereas the total generated current is denoted by IM. What is the equivalent ISC if two identical solar cells are connected in parallel? Why some band diagrams are filled? What is solar semiconductor treated with? What is the inner most electron band of an atom called? Can solar energy pass through a semiconductor?